This EA works in 2 modes. 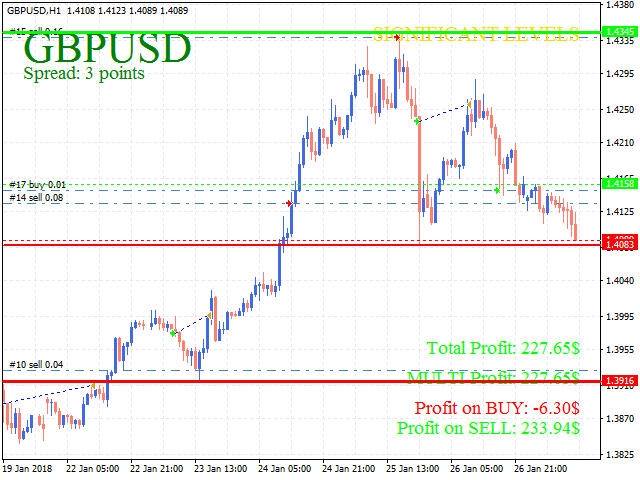 1 - on the rollback from the important levels, 2 - allows you to trade on breaking important levels. It always uses 6 levels at which signals to open orders are calculated. We recommend you to set Import 1 = 50, Import 2 = 200, Import 3 = 500. This will allow you to select levels that are already well formed and are important for trading. The EA works on any trading instruments, it is better to use a timeframe not lower than H1, leverage from 1:500. You can choose to trade only buy or sell orders, as well as close orders with multi-currency take profit (take profit on all open pairs). Trading on important levels has attracted many traders for a long time, now you can try it using the robot Significant Levels! MinStep - minimum step for purchase. MinProfit - minimum profit in points. If the profit is less than this value, the EA will wait. Take profit is calculated according to the following formula: if the levels are broken and profit in the currency > General_TP*Lot - deal will be closed. Stop loss is calculated according to the formula: if the levels are broken and the profit in the currency < General_SL*Lot*(-1) - deals will be closed. Same with MULTI_General_TP, MULTI_General_SL (without level analysis).